The right attitude is very important for positive personal growth. Is yours positive or negative? Wouldn't it be great if you could wave a magic wand and the child standing in front of you was no longer challenging you but was smiling and agreeing to help you with the housework? Wow now that would be good!! Too much to hope for do you think? Hmmmm maybe! I can remember writing out a sign saying 'Attitude Is Everything'. I pinned it up on my son's bedroom wall. Why? Well I hoped that it might be the encouragement he needed to say 'sure mum' when I asked him to tidy up his room. Guess what? You got it - it didn't work! I thought it was such a good idea too! Of course it's not only children who seem to be disagreeable at times is it? Sometimes it's the grown ups! It's not always easy to be bubbly and think that life is just fantastic all the time is it? Do you sometimes feel that nothing is going right for you? Is the glass always half empty and never half full. 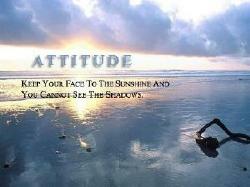 So what can you do when you have a problem with your attitude? It's important to realize that the success or failure in your life depends on how you see yourself. Do you see yourself in a negative or positive way? Try to realize that you hold they key to your success or to your failure! Yes you do! The key is inside you. It's your mindset! If you think you can't do something then you are right. 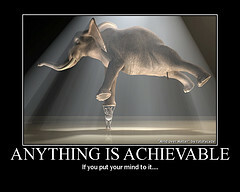 To gain success through attitude you have to believe anything is possible. If you reverse your thoughts and say that you can, then you will be able to do things that you didn't know you could. Do you dream about being successful? If you do you will have to take responsibility for your actions and thoughts. Start thinking "I can and I will." Then start doing! Discover how capable you are when you have the "I can do anything attitude." Tell yourself that you can succeed at whatever you decide. Believe this. Don't listen to people who tell you not to do something because they don't think you are capable. Prove to yourself that you are capable - and do it! When you succeed, do something else. Prove that you can! You are responsible for your attitude. If you hear yourself saying something negative, say something positive in its place. The choice is yours. You decide. Are you going to start believing in yourself? I hope so. You hold the key to your future development. Nobody else can give you your attitude. It is uniquely yours. Why not decide to make it a positive one? Let go of any negative thoughts that make you feel unhappy. With the right attitude you can achieve. Know in your heart that you are special. You are special to you. You are the most important person to you! Everyone comes second to you and that's how it should be. Once you are the way you want to be you can begin to take care of the other people in your life. When you have a positive mental attitude, you will notice how other people react to you differently. They will like the new you when you have invested your time in your personal growth success! Start today - give it a try! Click if you would like to share your personal growth story with us We can’t wait to hear from you!